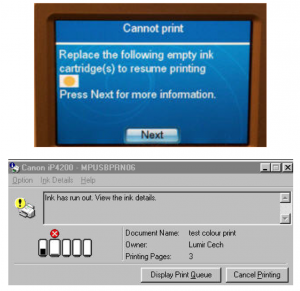 Carraway Office Solutions & office supplies provides service to our customers that may have difficulties with their office products like printers, scanners, and fax machines. Office machines are vital to a business’s professionalism and productivity. When a printer runs out of toner or ink, the business productivity comes to a halt. It is recommended that you keep extra office supplies on hand to reduce the risk of slowing down or stopping production. In Ashley Mott’s article How to Do Inventory of Office Supplies, her rule of thumb is to always maintain enough office supplies in inventory to sustain your office for at least one week. Regular sized printers can hold 600 pages of paper at once. For businesses that print a lot daily, like six boxes of copy paper per week, it is advised that you keep 5-10 extra packets of copy paper and 1-2 extra ink cartridges on hand at all times. Keep these supplies reserved for emergency and store them away in a supply closet or supply room so that they are easily accessible when they are needed. Keep in mind that it may take one week to have a new order of office supplies delivered. 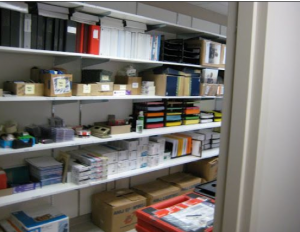 Keeping the office supply closet or supply room organized makes turnover time of replacing a product much quicker. Sort and place items into different categories. Keep copy paper and printer ink together. Place extra cords for electronics where no one will trip on them. In addition, notebooks can be stacked or stand on a designated shelf. Desk items like pens, tape, highlighters, staples, paper clips can go together. Filing supplies should have their own space also. If your business does not do much electronic filing, it is important to stay stocked up on ink pens, printed forms, and filing folders. Use labels to keep paperwork that is stored in a filing cabinet neat and organized. Having extra labels will allow you to file at any time in the office. It also reduces the need to clutter up your desk in the meantime before filing it away. Buying office supplies in bulk is convenient and maximizes productivity. Another benefit to stocking up in bulk is that there is usually a discount on purchasing several of the same products. If there is enough storage space, buy what your budget can afford and store products for the future. It is not ideal to have to leave work to pick up office supplies in a hurry because there is a deadline or a client is sitting in the office waiting on a form that hasn’t printed. Checking office supply inventory regularly will help ensure your business doesn’t run out of the necessary office supplies. Also, tracking inventory accurately keeps office supply purchases properly accounted for as either assets or liabilities. So, use an inventory log to record supply quantities. Logging the numbers in a notebook or electronically through a spreadsheet like Microsoft Excel will help. Purchase office supplies from Carraway Office Solutions today and use these helpful inventory tips to help you stay organized and productive without running into a supply shortage. Mott, Ashley. How to Do Inventory of Office Supplies. Web. 21 April 2017.